If fashion were to have a scent, then for Laura and Deanna Fanning – the twin sisters who presented their Central Saint Martins MA collection under a single moniker, Laura Deanna Fanning – it might well be that of petrol fumes. That was the smell in the air when they first encountered fashion in the pages of Italian Vogue as children in Australia, sat on stacks of the magazine in their mother’s aunt’s garage. 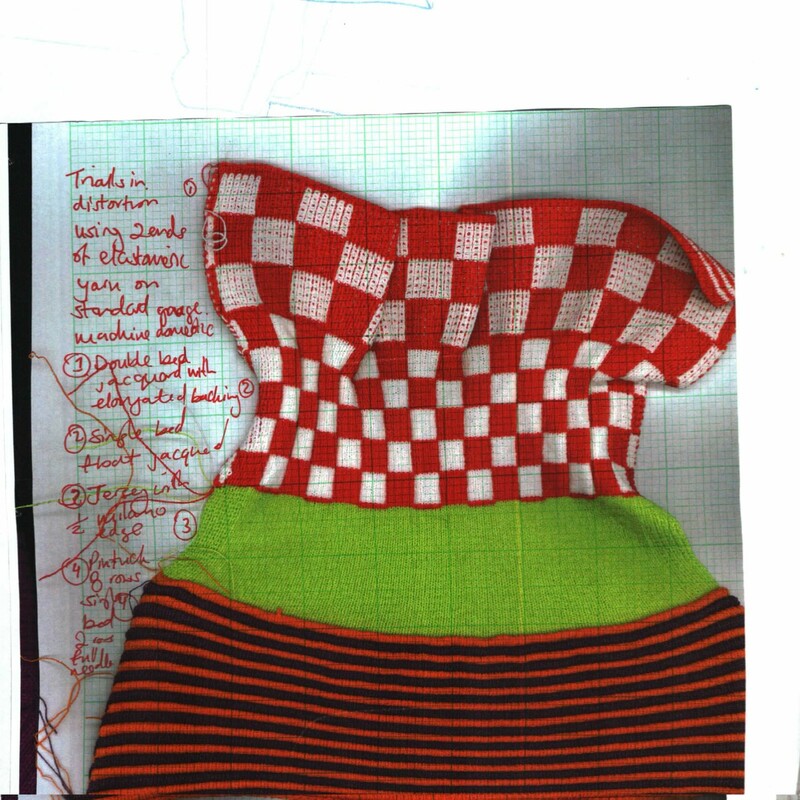 The images inside were often torn out, and drawn on – an attempt by their aunt to translate the designs, those of Claude Montana, or Azzedine Alaïa, into dresses she could make on her sewing machine at home. Now, in their London studio, part of a renovated ex-chocolate factory in Wood Green, they liken this process to their own moodboards, where, alongside swatches and sketches, fashion photographs from the 1970s and 80s are scrawled with emphatic directions in marker pen. The Fanning sisters grew up surrounded by women. “We don’t have brothers,” Laura says. “We were always around our grandmother and mum’s aunties, so it’s always felt like we’re about the female, about groups of women.” Accordingly, their MA collection, shown at London Fashion Week in February, followed this line of thinking, the pair finding inspiration in the power women of sci-fi movies of the 1960s and 70s, of increasingly obscure origin – “I found myself spending a day watching late 60s, post-boom west German sci-fi, they were really great,” Deanna says – enlivened by the way these women often travelled in packs. In keeping with the inspiration, the fabrics – all of which are knitted by Deanna, by hand – are shot through with acidic colour and a sporty stretch, while the garments are somehow amplified, invariably at the shoulders and chest, with padding. 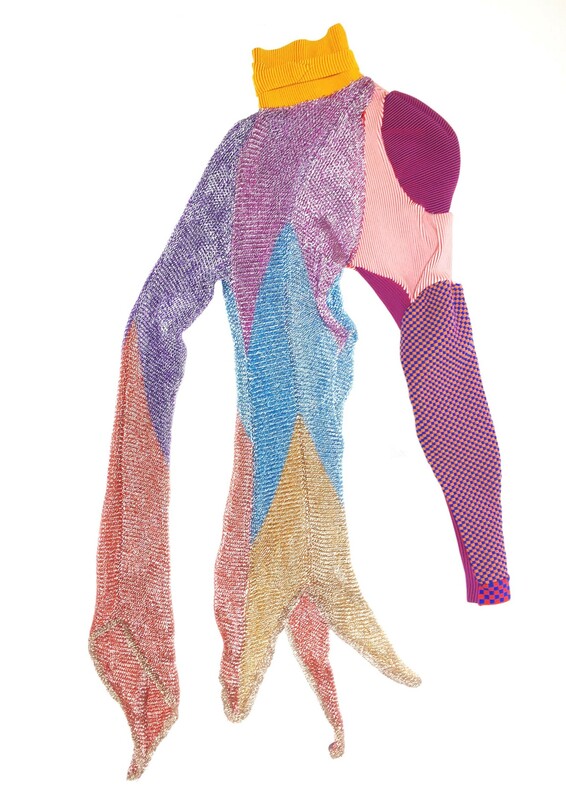 A feeling of armour comes through, too, in the “chainmail” knits – “they began with Barbarella and Paco Rabanne, and the 10th Victim,” says Deanna – though, in slices of rainbow colour, the chain-knitted gowns also found a forebear in clingy, disco-era lurex. In Laura’s words, this dissonance makes for a collection which is “aggressively feminine”. 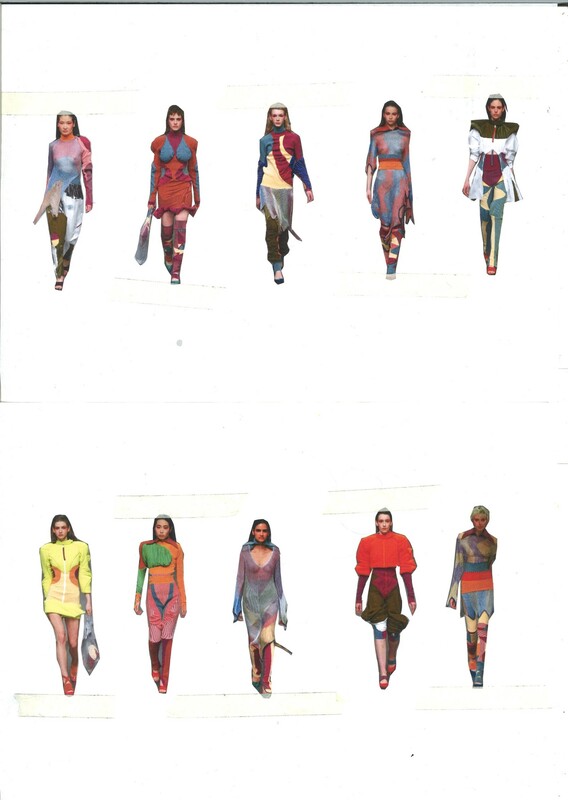 Their MA collection began life as a patchwork – Deanna had previously undertaken a BA in Knitwear at Central Saint Martins, so each garment started with her handmade swatches of fabric, which Laura, who studied womenswear back in Melbourne, then constructed into items of clothing. From there, a to and fro until they both were satisfied with final piece. This means of collaborating began in the first year of the acclaimed MA programme – though they applied the same year, they initially had no intention of working together – when they were paired, via ballot, for one of the early projects. By the second year, they found themselves creating a full collection together. The sisters, though, had their own sounding board in each other. “I know some people are okay doing it by themselves, but I think when you talk to someone about something all the time it reinforces what you’re doing. You create your own bubble,” says Laura. “You create this world and language and this is probably going to sound really corny, but being twins we have that world naturally. So, I guess it’s kind of extended from that,” Deanna adds. Top: Hair: Alex Brownsell at Streeters using Kérastase. Model: Anok Yai at Next NY. Casting: Noah Shelley at AM Casting. Styling assistant: Molly Shillingford.